We can't ignore the glaciers that are advancing and gaining ice. A few glaciers are advancing. Most are shrinking. Overall, they are losing 150 billion tons of ice a year. Glaciers respond directly and quickly to atmospheric conditions. As temperatures warm, summer melting increases. However, accumulation of ice in the winter also increases due to more snowfall. Air temperature tends to play the dominant role — there's a strong statistical correlation between air temperature and glacier fluctuations over large distances. Generally, when air temperatures warm, glaciers recede. Over the period 1946–2005, the World Glacier Monitoring Service (WGMS) monitored 228 glaciers. In the early years, just several glaciers were monitored. Over time, observations from more glaciers across the globe were added to the database, giving us a broader picture of global glacier mass balance. The highest-quality glacier observations are ongoing, continuous and long term. There are 30 glaciers in nine different mountain ranges that have been continuously measured since 1976 (11 of them reaching back to 1960 and earlier). These are considered "reference glaciers." What do these glacier observations reveal? 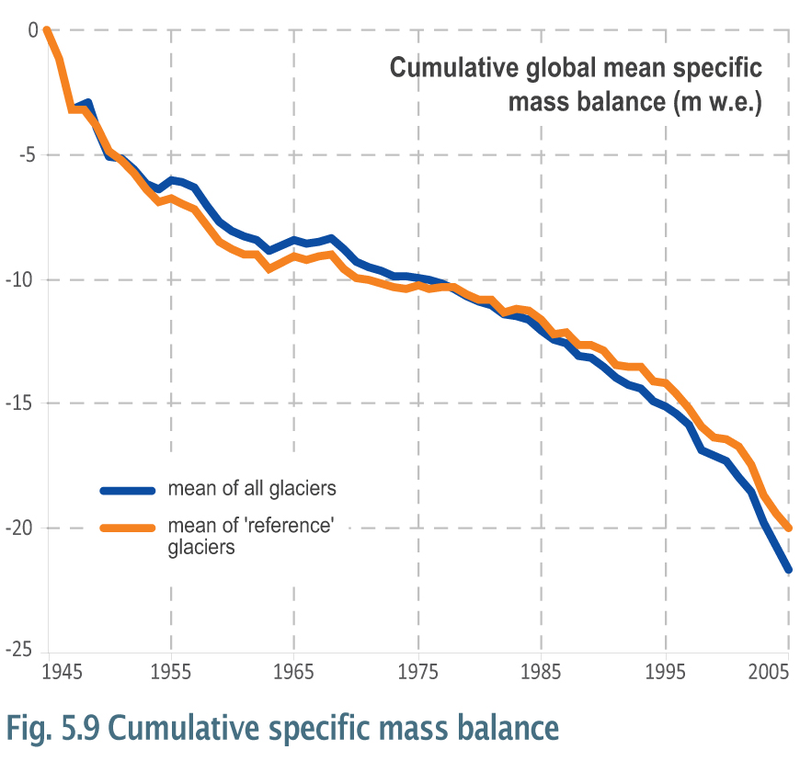 Figure 1 shows the mass balance of individual glaciers over 2002 and 2003. Negative values indicate shrinkage. We see that there are isolated glaciers that are growing. However, focusing solely on these few glaciers to indicate global glacier growth paints a very misleading picture. The vast majority of glaciers are receding. And importantly, the shrinking trend is increasing (e.g., 77% in 2002, 94% in 2003). Figure 1: Glacier mass balance over 2002 (blue) and 2003 (red). © M. Zemp, S. U. Nussbaumer, I. Gärtner-Roer, M. Hoelzle, F. Paul and W. Haeberli, eds., Glacier Mass Balance Bulletin No. 11 (2008-2009) (ICSU [WDS] / IUGG [IACS] / UNEP / UNESCO / WMO, World Glacier Monitoring Service, 2011). In its 2011 report, the WGMS measured 136 glaciers from Antarctica to Canada and from Bolivia to Japan, and found that almost 90% are shrinking (Figure 2). 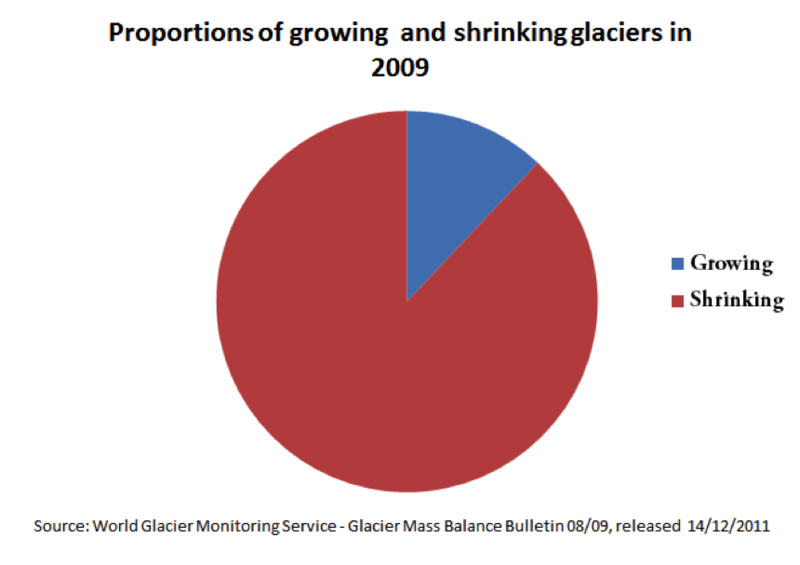 Figure 2: Percentage of shrinking and growing glaciers in 2009, from the 2011 WGMS report (PDF). What about the long-term trend in global glacier mass change? There are several methods for calculating global glacier mass change. One way is to use the average value of the 30 reference glaciers. Another is to calculate the moving average of all available glaciers. The results for both methods are displayed in Figure 3. The orange line is the average mass change of the 30 reference glaciers. The blue line includes all glaciers. 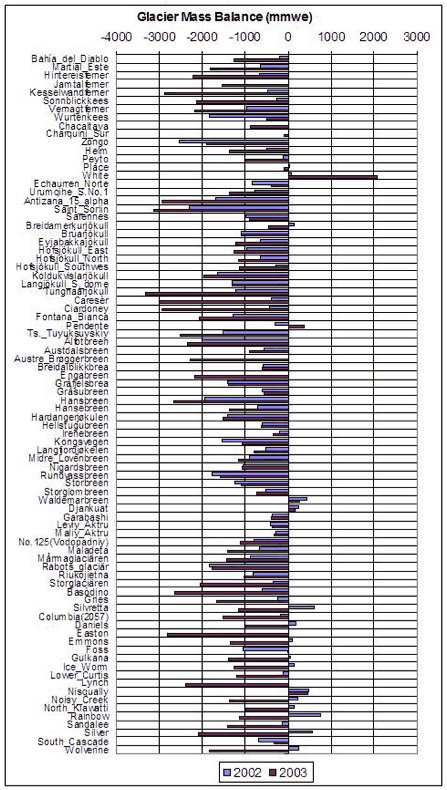 Figure 3: Cumulative mass balance curves for the mean of all glaciers and 30 "reference" glaciers. © M. Zemp, I. Roer, A. Kääb, M. Hoelzle, F. Paul and W. Haeberli, eds., Global Glacier Changes: Facts and Figures. (UNEP and World Glacier Monitoring Service, 2008): Figure 5.9. After 1975, glacier shrinkage continues to accelerate until the present. The mass loss from 1996 to 2005 is more than double the mass loss rate in the previous decade of 1986 to 1995 and over four times the mass loss rate from 1976 to 1985. When you narrowly focus on a few cherry-picked glaciers, you can be misled into an incorrect view of global glacier trends. When you take in the broader picture, you see that globally, glaciers are shrinking at an accelerating rate.